Judie Field, a newly qualified specialist practitioner district nurse, shadowed QNIS chief executive and nurse director Clare Cable for a day while a student at Queen Margaret University. 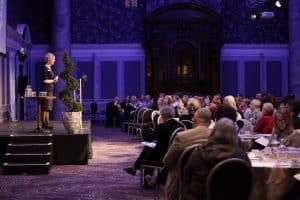 She attended the QNIS conference in Glasgow in March and here she shares her reflections on the event. 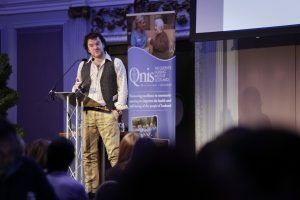 What impact did the QNIS conference have on you? The theme of the conference was “conversations that change lives…and build communities” and I came home feeling inspired, motivated and encouraged. 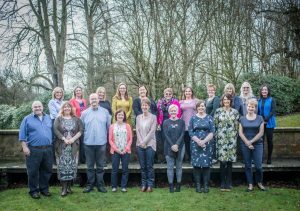 I felt challenged to reflect on scenarios that have impacted my nursing journey – the conversations I have witnessed or been involved in that have influenced who I am and the kind of nurse I want to be. A couple of scenarios sprang to mind straight away and I was keen to reflect on what made these conversations so meaningful. Hopefully they might even provide some encouragement to my future self. Tell us a little bit more about these scenarios? When I was a student nurse, I had a placement on a medicine-of-the-elderly ward. The charge nurse was notorious throughout the nursing team for running a tight ship. I was on this placement for ten weeks and from the outset we looked after a patient in her late 80s with a diagnosis of COPD. She had no visitors. She would often shout unpleasant comments and swear at members of staff who were walking past her bed. I, like the other staff, made several attempts to develop a therapeutic relationship with her, but she resisted any opportunity for meaningful conversation. Eight weeks on, she was informed that her COPD was deteriorating rapidly and it was time to consider her end of life wishes. She became very quiet for the rest of the day. At dinner time, the charge nurse and I were walking back to the nurses’ station together when we saw that she had started sobbing in her bed. Without hesitation, the charge nurse climbed on to the hospital bed beside her and held her, speaking soothing words and stroking her hair while Mrs H clung to her saying over and over that she did not want to die. I was so struck by that moment when they were no longer an authoritarian charge nurse and patient, but rather one human being seeing pain in another, completely casting aside any former issues and trying to comfort and demonstrate care for them. The charge nurse was later able to initiate meaningful conversations with her and support her in this time. The kindness and compassion demonstrated by her and the emotional response that this generated throughout the team has stayed with me. What about after you graduated? My second scenario further instilled a deep hope in me that practising person-centred care can really make a difference. My first job as a newly qualified staff nurse was on a very busy acute ward with patient ages ranging from in their 20s to their 90s. Due to the nature of the conditions that people had on this ward, they were frequently given a terminal diagnosis. Many of them chose to remain in the ward for palliative and end of life care. During my time working there, there were countless scenarios when my heart would break for the patient and their families as they came to terms with their new, usually unexpected, reality. In this ward, where sadness was a frequent visitor, the team consisted of some of the kindest and most selfless people I have ever known. There was a culture grounded in care, compassion and genuine love for the people that were being looked after and doing the looking after. Being part of this team instilled hope in me that despite working in some of the hardest conditions, nurses have the ability to transform the experience of others. 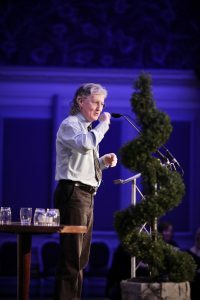 David Reilly spoke of the potential for conversations to have the power to unlock human change and healing. However, he also encouraged us to be mindful that we are not the source of this change or healing, rather we are to “create the conditions” for people to unlock their own potential. To me, this is a freeing and exciting concept – we do not have to bear the responsibility of “fixing” the people around us, but rather can cultivate conversations that create a shift in their perspective, promoting their own self-care. In the challenging times that we work in, I think it is particularly important that we reflect on the meaningful conversations we have heard or have been part of. What made them meaningful? What can we learn from them? And how can we translate this into our future practice to improve the experiences of others? Attending the QNIS conference prompted me to reflect on the scenarios above, which have reminded me of the enormous potential of our words. When there is such power in the human encounter, how can I make sure I leave people in a better state that I found them? Padraid O’ Tuama describes “offering hospitality to our words”. Hospitality implies generosity and a warm, well-meaning attitude. With words having the power that they do, we have the ability and responsibility to make sure they flow generously, full of warmth and hope, to improve the lives of those we encounter. By offering hospitality to our words and purposefully striving to create cultures conducive to human flourishing, we are not just participating in the creation of healing in others, they create healing in us.